Melanie is concerned that she might have a stalker. Christina tries to reassure Melanie - it's just a few phone-calls after all. Melanie won't be moved though and continues to panic that she might be in danger. Christina thinks that maybe the guy is just shy - he's not threatening her, after all. Melanie wonders if she should call the police. MELANIE: He's just out there. Waiting. Paul is arranging a conference that requires all the rooms - even his own, so he's rung Jim to ask if he can stay over. But since Jim and Beverly are still having problems, he says he'll make other arrangements. Caroline overhears and suggests that he stays at their place. Paul is a bit surprised - he isn't sure it's a good idea if they're all working together. Caroline says that he'd be doing them a favour - he might help to scare off the nuisance callers too. Paul agrees to move in this evening. Josh and Gloria are chatting. Melissa and Todd are at a table discussing how they can cheer Josh up. Melissa isn't keen to share her time with Todd, but Todd says that it's really hard when you start at a new school, and besides, they owe him for getting them back together. Paul has arrived with some of her stuff. Christina says that three people have called about the room and they're interviewing tonight. Paul agrees to help them vet the potential tennants. 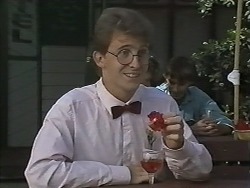 The first tennant arrives and Paul knows him - he's Kelvin Stubbs, the day waiter at the Brasserie. He is very clumsy and keeps knocking things over. Paul tries not to laugh. Caroline finds Melanie crying in the outer office - she's had another bunch of flowers from the weirdo, and they were on her front porch this time. Kelvin comes in with a tray and is surprised to see Melanie crying. He asks Caroline quietly what's the matter with her and Caroline tells him. Josh offers to make himself scarce when Melissa turns up - he tells Todd that she's been giving him funny looks. Todd tells him it's cool - he's had a word with Melissa. They talk a bit about computers. Melissa comes up and Josh tells her how lucky he is to have Todd as a friend. Melissa says that she is his friend too. Christina is having a cup of coffee. Gloria says she's heard about Paul moving in with the Alessi sisters, and tells Christina that Paul is difficult to live with - he's not really house-trained(!) Also his eating habits are a bit strange - he's not really domesticated. Christina smiles to herself. Gloria says that maybe living in that house will bring back a lot of bad memories. She says that Paul can snap when he's under pressure and Christina gets a bit worried. Caroline is telling Melanie that she's getting worked up over nothing. Just then, more flowers arrive and Melanie starts to cry again. This time, the note tells her to meet him at the Waterhole tonight, he'll be wearing a red carnation. Now Melanie doesn't know what to do. Caroline offers to come with her, but Melanie doesn't want to go at all - this bloke has been scaring the life out of her. Kelvin is waiting at a table wearing a red carnation and looking depressed. Melanie comes out of the Waterhole (must have changed her mind, then!) and looks suspiciously at the people sitting outside. She greets Kelvin and sits down with him without realising he is the stalker. She tells him all about the flowers she's been receiving and how angry she is. Suddenly Melanie notices the carnation and realises that Kelvin is her stalker. Kelvin apologises for scaring Melanie - he was just shy and didn't want to approach her. Melanie relents and agrees to go out with him. He is stoked. Melanie doesn't look too sure! Todd and Melissa are playing a computer game when Josh comes in. He's got a modem so he can link up with other computers, a bit like the movie, "War Games". Todd says he read about a guy hacking into a bank recently. Josh says he's going to show them what hacking's all about. Paul is on the phone to a potential tennant who turns out to be a nutter. Paul offers to help interview all their potential tennants. 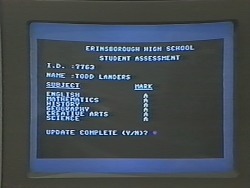 Josh has hacked into the Department of Education and got Todd's report card. He changes his grades to all A's. Melissa is unhappy - she thinks they could get into trouble.